There’s a young man down the street from me who trains with weights. He’s been at it for about three years but you’d never know it to look at him. He’s got no build at all. My grandmother’s been dead for twelve years and she probably still looks better than him. He came over to my house to talk one night. He brought an arm-load of magazines with him. I told him to sit down. He dumped the magazines on the coffee table. He’s a thin jittery type. He sits on a sofa like his back pockets were full of broken glass. I asked him how he was doing with his training. I asked him what program he was doing. He rattled off a jumble of exercises like a tobacco auctioneer milking the crowd. I never even heard of half of them. “Man, oh man,” I said. “No wonder you’re not gaining weight. Why don’t you go longshoring? You’d work about half that hard and they’d pay you for it.? He squirmed around like he’d been kicked and I began to feel sorry for him. I kept going and about half-way through the book I came to a story about a guy who was double bumping his pecs or something. I recognized his picture. He built up at Yarick’s and he looked better then than he does now. I closed it up at this point. I’ve seen lots of good looking legs but the only ones that thrilled me were on girls. “Well, no,” he said. “But I’m gonna stick with it. I got lots of starch in my spine. I said, “Gaining weight isn’t that complicated. It’s the easiest thing in the world. But there’s certain principles to follow and you’re not following any of them. One of the most important items is the amount of time you spend working out. You don’t need to spend very long at it. If you’re trying to gain weight you’re better off doing too little than too much. Three workouts are fine for an advanced man with nothing else to do but they’re suicide for a guy building up. Let’s be reasonable about it. Anybody who works for a living and spends three hours a day working out is making a social outcast of himself. Keep that up and the next sound you hear will be your old lady cackling as she runs off with the milkman. You can gain all the weight you want and still lead a normal life. The heaviest muscled man I ever met is Maurice Jones of Vancouver, B.C. You wouldn’t believe anyone could have that much muscle and every ounce of it was built with weights. I asked Maury how often he figured a man should work out. 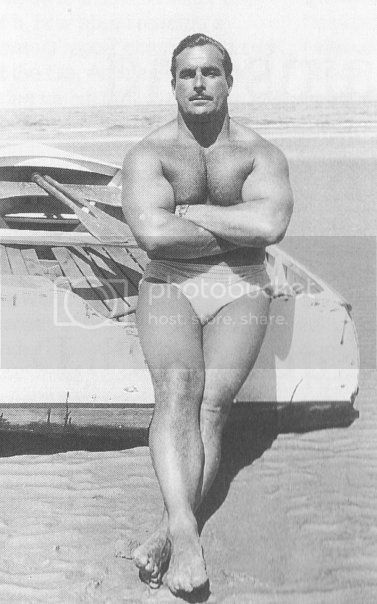 I watched Reg Park work out once. I timed him. His workout took and hour and four minutes. Gaining weight is a building process. Don’t tear it all back down again. You only have so much energy. If you exceed it you won’t build up. You might even lose weight. I was down in Chula Vista last summer. I dropped in to see Earl Clark. He’s a real friendly guy and built like nothing on earth. We spent a lot of time talking and I asked him how much time he spent working out. If you can’t gain weight you’re doing something wrong. You’re probably overworking. The late Harry Paschal published a weight gaining routine once. I tried it. The workout took forty minutes and I gained eleven pounds in a month. Peary Rader said he could never see any difference in the development of an advanced man who took about an hour and a half workout and those who spent half the day doing it. The extra time is largely wasted. If you’re trying to gain it can even be detrimental. Weight training is concentrated. You reach the point of diminishing returns very quickly. If you want to gain weight quickly and easily – good solid muscular weight – then cut down on your long workouts. Never, never, never spend more than an hour and a half at a workout. You can get through this in an hour or less. That’s plenty. If you can’t gain, work on this for a month or two and see what happens. You’ll gain weight, I guarantee it. #1 The best single exercise for the shoulder girdle. 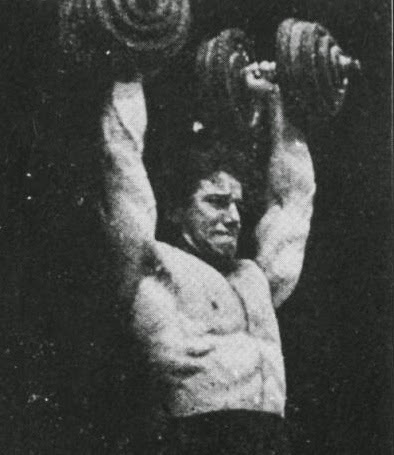 Take a wider than shoulder width grip and drive the bar up hard. Don’t pause at the bottom when you lower it. Get a rebound and drive it back up hard and fast. Don’t handle it like a crate of eggs. Be rough. #2 The best all-round back exercise. Round your back when the bar is in the low position. Pull up to your abdomen and arch your back. Try to contract your spinal erectors. #3 For chest and arms. Use a normal press width grip. Don’t pause at the bottom. Arch your back a very little bit and fire it back up again. This will thicken your arms and shoulders and put slabs of meat on your chest. Work up into heavy weights. #4 Not too important for gaining weight. Use a fairly close grip and do them in strict style. #5 The granddaddy of them all. Squats are the best single exercise for putting on weight. Do them in breathing style. Three monstrous breaths between each rep. Don’t pause at the bottom. Go down to slightly below parallel and bounce back up as hard and smooth as you can. Push hard. Fight. Drive. You should work up to about 150% of your body weight for 15 reps.
#6 Alternate pullovers with the squats. Use a light weight and stretch your rib-box. #7 The best lower back exercise. This works everything from your heels to the back of your head. Work up to at least 10 pounds more than your squatting poundage. Use a reverse grip. This exercise will increase your power and bulk beyond belief. Work hard on it. #8 This will keep your gut down while you’re gaining. There’s no point to getting fat. Breathe as deeply as possible between reps in all the exercises. There aren’t many exercises in the program. Work hard on every one. Don’t touch the weights at all on your in-between days. When you finish your workout have a shower and forget about it till your next training day. Get plenty of sleep and rest and eat lots of good food.